A Railway that Never Carried a Passenger. More than the usual interest is being taken in the announcement that a new picture house is to be erected at Paisley, says a newspaper report will be erected on the site of the disused Paisley East Railway Station which , for years has been a garage. Spanning the main Glasgow road before Paisley is entered is a railway bridge, which, although it was opened for traffic over 26 years ago, has never been crossed by train or engine. Beneath as the cause, the tramcar; and further along the line but a short distance lie the remains of another form of transport for whose death the railway itself was responsible. For "Paisley East" that was to have been is now a garage, and it is now giving way for a picture house. Round the bend, where lie the Anchor Mills,the railway crossed one of the two surviving links of the ill-fated canal that was to have linked Ardrossan to Glasgow by water and only got as far as Johnstone. Now the canal, taken over by the former Glasgow and Southwestern Railway, is practically a railway, and on the line that was to have carried the Barrhead workers to and from Paisley is in ruins. There are now no signal posts and no signal wires. The two or three signal-boxes scattered along the line are boarded up. That is the condition of the line between Paisley East and Barrhead. On the short distance the other way, from Paisley East to where it ought to have joined the main Caledonian line to Glasgow, there are no rails and no no sleepers left. A bridge that ought to have carried the line over a roadway at Whitehaugh is gone, and the permanent way stops just short of the main line. The explanation of all is that when the line was all but completed in 1903, the advent of the the trams knocked all consideration of running a train service out of court. But by Board of Trade regulation the Caledonian Company were under an obligation , if they completed the line to run a certain minimum number of trains per day. In order not to be under that necessity they purposely left the line unfinished. But what a sum of money must have gone with that decision. The line, from the main Glasgow line to Barrhead, is a little short of four miles. It was a double line, with two stations — Paisley East and Dykebar. The construction necessitated at least fifteen bridges and several deep cuttings and at one point they had not only to make a bridge but to run the road beneath it, the public authority being dissatisfied with the idea of a level crossing. A two-room and kitchen house has been made out of Dykebar station. Paisley East became a garage. It would be difficult for the original designers of Paisley East station to recognize their handiwork. No phantom trains draw into its platforms, no ghostly passengers stand waiting for the shrill whistle that should be heard at midnight, no spectral porters call the last train. The Paisley-Barrhead line is that last of all abandoned things, a human work that has never been used. Station was boarded up with sheets ? corrugated completely at one end and partially at the other. The garage was on the platform level and served a good purpose for a number of years. Over the site of the station will rise the latest in picture houses, where soon the Paisley folk will be enjoying the latest from the film world. In 1902 the Caledonian took over the affairs of the Paisley & Barrhead District Railway, a local venture that had been authorised on 6 August 1897 to exploit the supposed riches of Barrhead and the Gleniffer Braes. The line was to form a wide circle beginning on the Gourock line at St James west of Paisley, sweep in a circle south and east to pass across the face of of the Braes and south of Barrhead and turning north drop down the Braes to a junction with the Glasgow & Paisley Joint line at Greenlaw east of Gilmour Street station. From the top of the circle a line was to cut into Barrhead (where there would be two new stations, South and New) and then climb into the hills to join the Lanarkshire & Ayrshire at Lyoncross.The planned new lines opened up exciting possibilities for the Caledonian. A circular service covering Paisley, Barrhead and intermediate stations would rival the G & sw service. Like the G & sw circle trains the Caledonian trains would have to reverse in Barrhead. The Caledonian trains on the circle would join the coast line at St James, pass through Gilmour Street and regain the circle line at Greenlaw Junction. By introducing certain spurs still wider circuits could be accomplished. For instance trains could be run from Glasgow to Barrhead via Greenlaw and return via St James. An even wider circle would be possible if trains were sent out over the Lanarkshire & Ayrshire to Lyoncross and then down the new line through Barrhead to Paisley. Construction of the line began on 15 August 1898, and the Caledonian forthwith embarked on the Battle of the Braes. 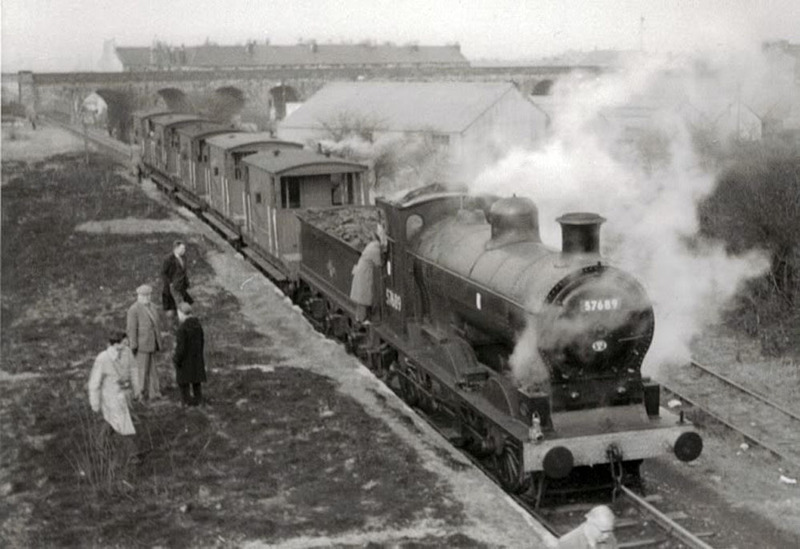 Almost immediately the Paisley & Barrhead board received an imposing petition from the merchants and manufacturers of Johnstone asking that a branch be run their town.The petition was rejected, but on 9 August 1899 the Paisley & Barrhead decided to double the portion of their line lying between the Lanarkshire & Ayrshire and the Glasgow & Paisley Joint Line in anticipation of of heavy coal traffic from the L & A. The line was run without difficulty round the western outskirts of Paisley and up the Braes towards Barrhead. Stations were built at Ferguslie, Stanley and Glenfield. The line was then taken into Barrhead (New) station (on the way being linked with the G & sw line at Blackbyres Junction) and over the town on a massive stone viaduct. Then followed a stiff climb up the slopes to the junction with the L & A at Lyon-cross. From Blackbyres Junction the eastern half of the circle ran back down the Braes to Greenlaw on the Glasgow-Paisley line. The Caledonian and the o & sw came into direct conflict at the approaches to Barrhead. The G & sw so planned the Barrhead extension to its Potterhill branch that the Caledonian was forced to make an alteration in its levels, an embankment becoming necessary where none had been planned. Charles Forman, the engineer, complained that the Potterhill-Barrhead line 'has evidently been laid out to interfere with and hem in this company's line 'as much as possible'. However, the Caledonian forced the G & sw to pay the cost of the materials for the embankment. The Battle of the Braes ended in farce. Both the Caledonian and the G & sw were driven from the field by the electric tram. The Caledonian admitted defeat when its line was nearing completion. Passenger stations, some of them almost ready for service, were abandoned before they had issued a single ticket. ... The ill-fated Paisley railways left the district, and especially Barrhead, , with ugly, decaying railway properties. The town centre of Barrhead was a clutter of mouldering stations, rusty abandoned bridges and weed-covered embankments, memorials to the suburban service that never was.In the end the local council dumped the town refuse on the abandoned railway site. While the Caledonian and Glasgow & South Western were squabbling over routes to Barrhead they were jointly (as proprietors of the Glasgow & Paisley Joint Line), pushing a new railway into Renfrew.